1.1 No runners from Home Plate. 1.2 Non-runner batters will be called out, if the ball does not leave the infield-Umpire will call it a dead ball and any runners on base will not advance. 2.2 Manager’s and Umpires will insure that outfielders will stay in place and not move in for weaker players. 3.1 Batter must declare to the Umpire whether he is a runner or non-runner -- this status remains the same for the remainder of game. 3.2 The 1 and 1 count will continue for the 2019 season. 4.1 Three (3) home runs (over the fence) per game, per team-any home runs over three (3) will be counted as a single. 4.2 Balls hitting the Green will be a hit unless fly balls are caught. If a base runner is on 1st, 1st & 2nd or 1st, 2nd & 3rd. they get the next base. 4.3 Runners may advance at their own risk after the next base is taken. 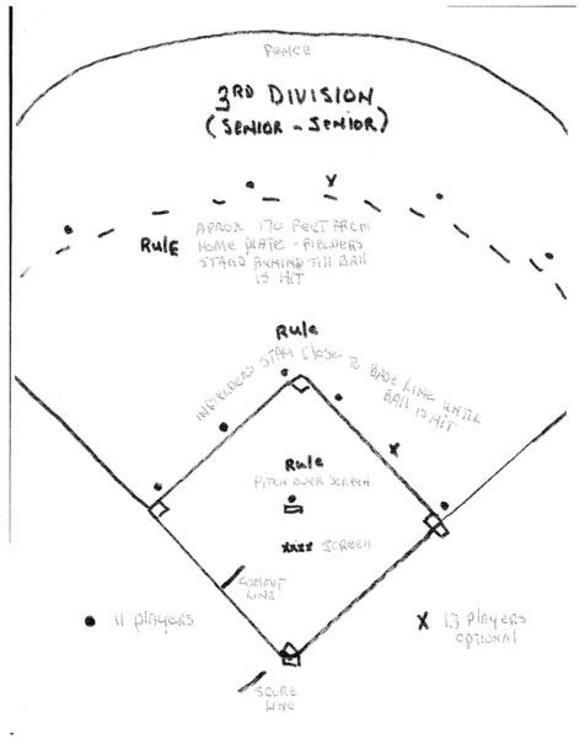 5.1 Division 3 will play seven (7) innings following the rule of Divisions 1 and 2 for weather and mercy rules. 5.2 The season will consist of 2 halves and playoff format will be selected by managers. 5.3 Field 5 games will be played at 10;45 for the first half and at 9:15 the second half. A three (3) foot Commitment line shall be marked perpendicular to the foul line halfway (32 ½ feet) between third base and home plate. No tags allowed on runners past the Commitment line. A three foot line 15 feet from home plate on the first base line will be set as the Restraining Line. If there is a substitute runner for the batter and the batter crosses that line the play will not stop, it will be treated as a delayed call. If the runner for the batter makes it to 1St. base, he will be called out at the end of the play. All Divisions There will be no scoring plate. There will be a scoring line that will be an extended 1st. base foul line. The scoring line is used by the offense (runners) only. A Strike Zone Board will be used with the front of the board centered on and in line with the front of the field home plate. The board will be twenty two (22) inches wide and thirty four (34) inches long. The Board will lay on and completely cover home plate. An additional base shall abut first base. The additional base will be in foul territory. A pitcher’s safety screen will be used in all Divisions. Placement of the pitcher’s safety screen will be on the glove side of the pitcher, to the middle of the pitching rubber, three (3) feet or one stride in front of the pitching screen. Protective equipment and cool weather clothing is allowed. The Home team will wear white shirts and use the first base bench and right field for pre-game practice. The Visiting team will wear red shirts and use the third base bench and left field for pre-game practice. Players, Managers and Coaches must be in proper uniform. Pants or shorts must be dark blue or black in color, strips and logos are permitted. Hats, Shirts, Pants and Shorts approved by Huff-n-Puffers will only be permitted. Pants of any style may be worn under the shorts. Players not in proper uniform will not be permitted to play. This rule will be enforced by MANAGER’S and UMPIRE’S. All equipment will be shared by both teams unless privately owned. Home teams will furnish game balls supplied by the league. These balls will be determined in all particulars from time to time by the Governing Board and the Governing Board can in its discretion choose a different ball for each division of the league. The Commitment Line, Scoring Line, Strike Zone Board, Pitching Screen and the Double Bag at first base shall be used at all scheduled and playoff games. Anyone using an illegal or altered bat (shaved, rolled, etc.) as defined by the USA Rules will be subject to ejection from the game and further punishment as determined by the Governing Board. Division 1 teams may field a maximum of twelve (12) defensive players. Division 2/3 teams may field a maximum of thirteen (13) defensive players. All teams must have nine (9) players from its roster to start a game. Substitute players may be added for a total of twelve (12) for division 1. Division 1 substitute players may be used as follows: A “B” or lower may replace a “B” player. A “C” or lower may replace a “C” player. A “D” or lower may replace a “D” player. A “E” may replace a “E” player. Any player may replace a “A” except another “A” player. Substitute players in Division 1 can be for the positions of Catcher, Right Field, or First Base. Division 2/3 substitute players can play anywhere. Division 2/3 teams may replace an A for A, B for B, etc. for a total to equal the opposition (13 vs 13). (**) Players from Divisions 2/3 can be asked to be a sub player in Divisions 1/2 regardless of their ranking. Substitute players must bat at the bottom of the order. Each Manager will have a Roster List of all teams in their Division. A team must be ready to play ten (10) minutes after the scheduled starting time or suffer a forfeit. Game starting times are 9:15 A.M. for the first game and 10:45 A.M. for the second game. The second game is scheduled to start ten (10) minutes after the preceding game. Field conditions may warrant changes in starting time. 5.1 Division Managers: Managers in each Division will decide how they want to draft players on draft day (either be it by core or 1,2,3,4,4,3,2,1 etc. ), or any other method they choose until all players are drafted. Managers will not be drafted; they will be assigned to the team they are drafting and managing. 6.1 All Divisions/Strike Count Each batter will start with a one (1) ball and one (1) strike count. 6.2 All Divisions/Number of fouls Two (2) fouls after two (2) strikes is an out. A legal pitch is a minimum of six (6) feet from the ground and a maximum of twelve (12) from the ground. Striking any portion of Strike Zone Board, will be a strike. The pitcher must have one foot touching the rubber when delivering the pitched ball. See sub-rule 1.6 for details governing the placement of the Pitcher’s Safety Screen. A batter’s first batted ball hitting the screen, if not touched by a defensive player prior to hitting the screen will be ruled a dead ball and is not playable. A thrown ball hitting the screen is a live ball and is playable. A batter will be allowed to hit the Pitcher’s Safety Screen once (1) in each at bat with no change in the existing count and a dead ball call by the umpire. Subsequent hits against the screen will be called strikes. Division 1- Allow runners for a batter from home plate. The Substitute Runner can only run to 1st. Base and must stop there. If the ball is hit over the fence, then it’s a home run. A Batter Runner will stand behind a line drawn from the back corner on the lefthanders side of home plate perpendicular (right angle) the screen or the WHITE & RED MARKER hanging on the fence. The distance shall be no less than eight (8) feet from the back of home plate. The criteria used for substitute runners for the batter will be injured or hurt (NOT SLOW). All runners running for the Batter or a Pinch Runner will be the PLAYER making the last out. If the PLAYER making the last out is not able to run, then the PLAYER making the next to the last out will be the runner. Once a runner is on base he will continue to run until he scores or he is out. If the runner is on base when it is his turn to bat, a replacement may be put in for him and there is no out recorded. If a runner is needed at the beginning of a game with no outs recorded, the manager’s must agree on a runner or it defaults to the last batter in the lineup. Division 2/3 can have as many runners as needed as agreed to by the manager’s before the game. Any player may run for the batter at any base he safely reached before the next pitch. The last out batter does not have to be the runner. The manager will choose the runner. If the runner is on base at his turn at bat, the runner he replaced is recorded as an out, but the runner does not lose his turn at bat. Any team member may courtesy run only once per inning. Penalty: the runner is out. Sliding or diving into a base is permitted. A base runner may be out at Home Plate in a non-force situation without a tag: If the runner has crossed the Commitment Line, the defensive player must have possession of the ball while touching the Strike Zone Mat before the runner has touched the Scoring Line. The runner will be called out if he touches or crosses the Strike Zone Mat. No tags are allowed on runners that have crossed the Commitment Line by a defensive player. Once a runner or ( any part of his body) touches the ground on, or beyond the commitment Line, the runner may not return to third base. A violation of the rule will result in the runner being called out. To score, a base runner must touch the Scoring Line before a defensive player in possession of the ball touches the Strike Zone Board. A runner shall not be called out for contact with a defensive player not in contact with the Strike Zone Board, unless, in the umpire’s judgement, the runner deliberately hit or could reasonably have expected to minimize or avoided the contact under the circumstances and failed to do so. If there is a play on a batter going to first base, the first baseman must touch the white bag of the double bag in fair territory and the batter (runner) must tag the orange base in foul territory. The first baseman can tag a runner before he touches first base for an out. To avoid a collision, a fielder or a runner may use the other base. Runners who fail to step on the orange base are liable to be called out if a defensive player appeals; before the runner returns to the base. Scorekeepers on the opposing teams must agree on the score of the game at the end of each half inning. All teams should keep score. All players who are physically able to play must play in each game.Division 1, all players must play at least four (4) innings on defenseunless physically unable to play, or you are the Designated Hitter and the opposing manager is to be notified. Only two (2) runners are allowed for Division 1 because of an injury or physical disability tohave a designated runner (DR) starting from home plate. A player removed because of an injury will not be an automatic out. Opposing managers must be notified of any player physically unable to participate before the game and if any changes occur during the game, the opposing manager must be notified immediately. Division 2, all players must play at least four (4) innings in each game, and Division 3 it will be 3 innings, Division 2/3 teams will be allowed as many runners as needed due to injury or physicaldisability as agreed to by the Manager’s before the game. The managers of each team will exchange lineup cards (if requestedprior to the start of the game) listing the offensive players in the order in which they will bat. A round robin schedule will be used during regular season play. Rain-out-games will be re-scheduled as to the time and day by the Umpire-in-Chief with the approval of the Manager’s involved. Game in play that are called because of rain before they are a complete game shall be made up at a later date as a complete new game be-ginning at the first inning. A complete game is a minimum of five (5) innings or four and one half (4½) innings if the home team is ahead. Field conditions for the playing of games shall be determined initially by the Parma Service Department. After a game starts, the umpire(s) working the game will make the decision if the game can continue. until one of the teams out scores the other in an extra inning(s). Division 1: Will have no time limit. Division 2 will play eight (8) inning games. A fifteen (15) run “Mercy” rule will be in effect after six (6) innings, or five and one half (5 ½) innings if the home team is ahead, thus ending the game. Division 3 will play seven (7) inning games with the same Mercy Rule as in Rule 10.7. This rule does not apply to post season tournament or tie-breaking playoff games. Division 1 will play nine (9) inning games. A fifteen (15) run “Mercy” rule will be in effect after seven (7) innings, or six and one-half (6½) innings if the home team is ahead, thus ending the game. This rule does not apply to post season tournaments or tie-breaking play-off games. A one ball and one strike count will be in effect on each batter. All games played will have a five (5) run limit per inning for all but the last designated inning. The game umpire shall determine the last inning based on time restraints and shall inform both team manager’s before the start of the last designated inning. Infield practice between each inning will be allowed by the umpire only if time restraints allow it. You may have one and only one designated hitter on each team (optional), if he is able, he must run for himself. If you have 12 players, he can still DH, however you will only have 11 players in the field and cannot pick up players unless you have less than 12 total. If a ball leaves the playing field, such as going under a fence, the player will not touch the ball, but will raise both hands as a signal to the umpire. The umpire will then come to the location and make a decision. Failure to follow the procedure will result in the ball being ruled in play. 1. Establish a list of qualified umpires. 2. Assign an umpire(s) to each scheduled game. 3. Scheduling of make-up games. The notification of intent to protest must be made immediately before the next legal or illegal pitch or before both teams have left the playing field after the final out. Ineligible player protest can made at any time. All protests shall be presented to any member of the Rules Committee before the next scheduled game from the team submitting the protests must be submitted in writing and presented to any member of the Rules Committee before the next scheduled game from the team submitting the protest. The Rules Committee will rule on all protests as soon as possible after the date of receipt of the written protest. The deadline set for filing an application for league membership for the current year is June 1st, and the deadline for trading of players with the consent of both Manager’s and players involved is May 15th. Division 1 will have no set date for the addition of new players. Division Directors will designate where new players will be placed. The deadline for filing for an application for league membership shall be determined by the Governing Board. Playoff and Championship Games must be played without adding any players from other teams. In the event of a tie for the first half Championship, the winner will be decided the first time the two teams involved play each other in the second half. This game will also count in the second half standings. Divisions 1/2: Will have a first and second half. All Divisions: Home team will be determined by a coin toss. Divisions 1/2: If at the end of the season, first and second half Champions cannot play due to weather or city commitments, the team with the best overall record will be declared the Champions. Divisions 1/2: Will play a split season with a best of three (3) game play-off at the end of the season. A one-game playoff will decide the winner of each half in the event of a tie. Home team will be determined by a coin toss. A double elimination tournament may be held at the end of the regular season for all teams interested. In the playoff or tournament games, a player cannot be a substitute unless his team has been eliminated. All new ballplayers applying for the Huff-N-Puffers will be invited to the annual evaluations of new ballplayers before the draft. The evaluators will be the current and/or new managers. All managers will evaluate all ball players. The managers will determine what division the ballplayers should be placed. If the ballplayer wants to go to Division 1, he can enter Division 1 draft and if not selected he will be put in the Division 2 draft. They will be evaluated on hitting, fielding, throwing and running, then given a grade of A,B,C,D, or E. This in-formation will then be available for the drafts. Rule changes will only be considered before each season begins. If you have a rule change that you would like to submit, you must put it in writing, sign it, and get it to the Rules Chairman. You can also give it to your Manager, any Officer, or any member of the GoverningBoard and they will submit it to the Rules Chairman. Unresolvable disagreements between a player and manager regarding his team assignment will be resolved by the Governing Board. All injured players must have a Doctor’s release to return to an active team roster. A player refusing to play on a team drafting him will be suspended unless a trade can be made. Conduct not considered in the best interest of the Huff-N-Puffers will be subject to disciplinary action. Fighting between players will result in removal from the game with a three (3) game suspension (the following three (3) games) for the first offense. The second offense will result in suspension for the season. Fighting in the parking lot or near the playing area is part of this directive. Profanity will not be tolerated on or off the fields: players will be ejected from the game and be suspended for the next game. A second offence can result in suspension for the season. (REMEMBER, LADIES AND CHILDREN ARE IN THE STANDS). A runner must make every effort to avoid colliding with opposing players while running the bases or sliding or diving. If in the umpire’s judgment the runner fails to avoid a collision with a defensive player involved in the play, the ball will be declared dead and that runner called out. If in the judgment of the umpire the collision is considered malicious (bowling over, throwing elbows, etc.) by either the runner or defensive player, the ball will be declared dead and the offending individual will be ejected from the game and suspended for an additional game for the first offense. A second offense will because for suspension for the remainder of the season.